The Governor declared a state of emergency in advance of Saturday's protest marking the one-year anniversary of a white supremacist rally that took the lives of three people, and became the representative moment of the racism and division that has festered under the administration of Donald Trump. 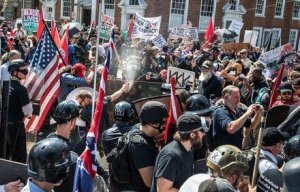 One year ago, In Charlottesville, Virginia, a Unite the Right rally protesting the removal of a statue of Robert E. Lee, the leader of the Civil War's Confederate army, turned into a full-blown riot. Torch-wielding white supremacists violently clashed with police and counter-protestors, ending when one drove his car into the crowd. When it was over, 32 year-old counter-protestor Heather Heyer was killed, morethan 30 people were injured, and two responding state troopers were killed when their helicopter crashed. That afternoon President Trump addressed the nation, condemning the "egregious display of hatred, bigotry and violence on many sides." 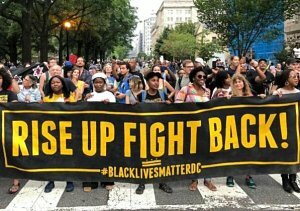 The President's remarks, which failed to call out the white nationalists and neo-Nazi groups by name, sparked hundreds of Solidarity events nationwide the next day, protesting the violence and racism. In the immediate days after, Trump reiterating his earlier claim that anti-fascist protesters shared equal blame, "What about the alt-left who came charging at the alt-right?" Then, infamously, "You had some very bad people in that group. You also had some very fine people on both sides." His offensive response to the Charlottesville tragedy was met with a firestorm of criticism from both parties, comments from five of his US Joint Chiefs, the resignations of nine members of Trump's American Manufacturing Council, eight members of the National Infrastructure Advisory Council and all 17 members of the President's Committee on the Arts and Humanities. In the end, Saturday's rally in Charlottesville was largely a counterprotest with hundreds of students and progressive groups taking to the streets amidst a heavy police presence. Unite The Right's Jason Kessler, who was denied an event permit in Charlottesville, organized a follow-up demonstration in Washington on Sunday that drew thousands -- but not in support of his cause. Of the sea of demonstrators that descended on DC yesterday to protest the violent events of last year, less than 30 were among the heavily-guarded white supremacists, most with covered faces, that attended. While they may lack public presence, however, their impact is still felt. 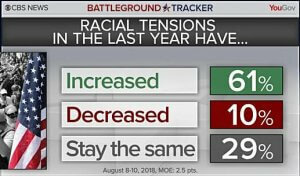 An August 8-10 CBS News/YouGov poll found that 61% of Americans say that racial tensions have increased over the past year. "We are going to have our differences, we are going to be angry with each other, but let's channel that anger not into hate, not into violence, not into fear. Let's channel that difference, that anger, into righteous action...I'd rather have my child, but by golly if I have to give her up, let's make it count."